You’ve heard about Fair Trade products, right? Maybe you’ve seen a purse, or vase, or package of coffee that is labeled as Fair Trade goods. What “Fair Trade” means is that the products are made in a village in a land far away before they are marked up and sold here, right? Fair Trade products have been sold since 1946, and today they encompass a wide variety of agricultural and handmade goods. 1. Fair Trade is a business strategy to help alleviate poverty and create sustainable development by improving the lives of the those who frequently lack alternative sources of income. Fair Trade Organizations make their artisans and producers the primary concern of their enterprise. 2. Fair Trade involves working relationships that are fair, consistent, and respectful. It celebrates the cultural diversity of communities, while seeking to create positive and equitable change. 3. Fair Trade is a means to help develop producers’ independence and freedom from oppression. It enables a safe and healthy working environment free of forced labor. 4. Fair Trade Organizations help producers to improve their skills and increase access to markets. 5. Fair Trade Organizations often help producers and artisans with financial and/or technical assistance. 6. Fair Trade Organizations share lessons learned and best practices that will enable further growth. 7. Fair Trade seeks to generate equal pay for equal work, empowering producers to set prices that take labor, time, and materials into account. 8. Fair Trade means a safe and healthy working environment free of forced labor. 9. Fair Trade Organizations seek to eliminate discrimination based on race, caste, national origin, religion, disability, gender, sexual orientation, union membership, political affiliation, age, marital, or health status. Members support workplaces free from physical, sexual, psychological, or verbal harassment or abuse. Members respect and support the UN Convention on the Rights of the Child, and do not support child trafficking and exploitative child labor. 10. Fair Trade Organizations reduce, reuse, reclaim, and recycle materials wherever possible. They encourage environmentally sustainable practices throughout the entire trading chain. This is a company I love! They have the most beautiful leather bags, jewelry and other goodies… and all products are made by women both locally and globally who have overcome extraordinary circumstances… anything from addiction to depression to prostitution. Check it out using my link: http://fashionable.refr.cc/P3ZD6N2. 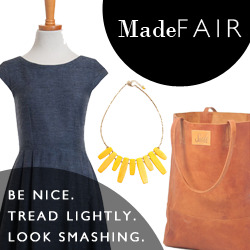 MadeFAIR is a fabulous online retailer of ethical, sustainable, and Certified Fair Trade clothing and accessories. We search for the happy, fashionable medium between exclusive leather bags and simply beautiful handicrafts. And you’ll get free shipping on all purchases of $100+. Novice carries unique handmade products, great value, and the joy of helping to nurture and elevate the craft of global artisans. They operate a completely transparent system where artisans are free to raise or lower their own prices, and can even put their items on sale. To date NOVICA has sent over $68.4 million to their artisans around the world. Save 10% on traditional handmade crafts from around the world. Valid 5-9-16 through 5-15-16. Also, save 10% on select handcrafted jade jewelry. Valid 5-9-16 through 5-15-16. At the heart of Organic India’s teas and wellness supplements is a commitment to be a living embodiment of love and consciousness, using organic and biodynamic agricultural practices. (This brand is a mainstay in my house!) They pay all the farmers’ fees associated with acquiring the necessary organic certifications for them. This means farming families are supported by a sustainable income, while at the same time improving and preserving their own health and natural environment. 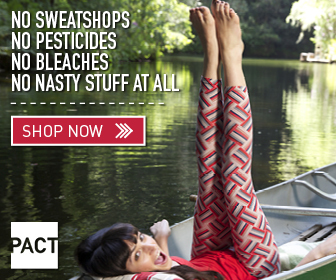 Sweatshop free, Super soft organic cotton underwear, tees and socks. PACT Apparel. There are no chemicals used in their super soft, comfortable, and adorable organic apparel items. prAna creates versatile, stylish, and sustainable clothing and accessories that you can wear during every activity, every adventure, every day. They are the doers — yogis, climbers, and world travelers — and they use their knowledge to make clothes that look good and play hard. prAna was one of the first major clothing companies to offer Fair Trade Certified™ products in partnership with Fair Trade USA. The power of Himalayan salt is well documented. Every salt crystal lamp and Salt product from SO WELL is eco-friendly and fair trade. 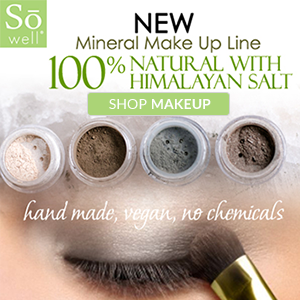 So whether you decide to cook with Himalayan salt, nourish your skin with it, or enjoy its glow in a handcrafted salt lamp, you can feel good about it. Get 20% off all purchases of $50 or more right now with the code SPRING10 at checkout. 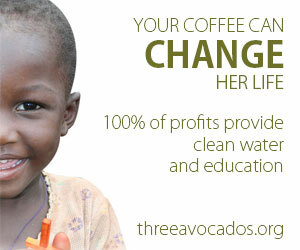 100% Of Three Avocados Coffee‘s net proceeds provide clean water in Uganda and education in Nicaragua. They sell amazing coffee and goods for an amazing cause. By working directly with producers and cutting out middlemen, Fair Trade Organizations can keep products affordable for consumers and provide a greater return to the producers and artisans. Respect, more affordable prices for goods, and better wages for workers sure sounds like a pretty fantastic business model. Don’t you think? Disclosure: There are affiliate links in this post. Please see our affiliate disclosure for more information.